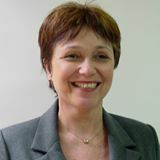 I had been showing clinical cases in the page lidiayavich.com and in several groups. Some of them with rehabilitation and with tridimensional orthodontics, always after treating the TMJ. In this post I’m not going to show all the sequence of the patient. I have the intention to show the improvement of the signal of the MEDULLAR OF THE CONDYLE that had presented osteonecrosis. 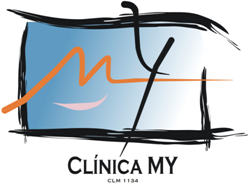 Anamnesis and clinical inspection are a fundamental part in the diagnosis of the patient that presents TMJ pathology. Images are primordial when we study any sinovial joint, unfortunately I see patients with valuable information in their images that were told that those are just occasional findings. MRI (magnetic resonance imaging) can give a lot of information and not only the disk position information. Logically is necessary to know what to do with that information. Osteonecrosis of the mandibular head corresponds to a death of the osseous tissue, also called avascular necrosis. Alteration in the bone marrow of the mandibular condyle is a possible cause of TMJ pain. MRI: T 1 closed sagittal rightTMJ before treatment. Avascular necrosis in the acute phase can be diagnosed only through MRI imaging or biopsy. The differential diagnosis of altered signal intensity in the mandibular condyle starts with an awareness of its normal signal characteristics. This condyle has also a severe irregularity on the superior pole, with loss of substance, but in this post I want to analyze the bone marrow signal. Of course, in a diagnosis we need to consider all the information. MRI: T1 closed sagittal rightTMJ before treatment. Avascular necrosis occurs when blood flow to a bone is interrupted or reduced, which may be caused by several conditions, like joint or bone injury, pressure inside the bone, medical conditions, among others. 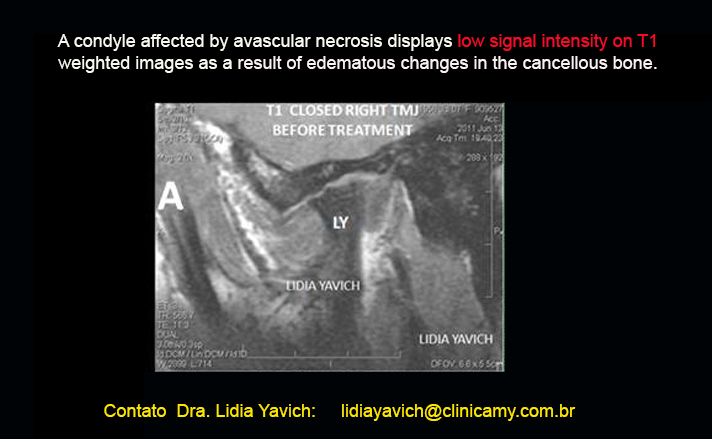 A condyle affected by avascular necrosis displays low signal intensity on T1 weighted images as a result of edematous changes in the cancellous bone. 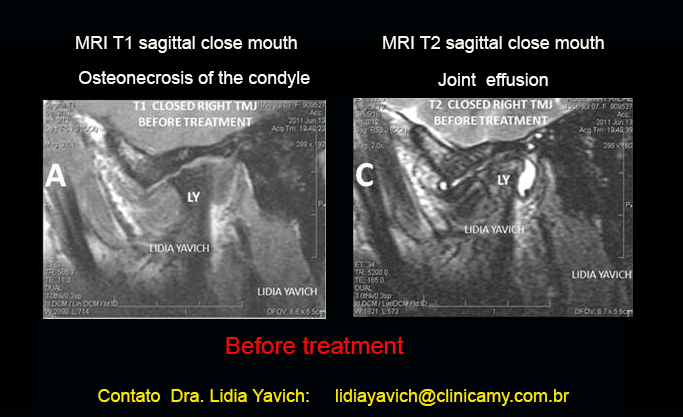 MRI: T2 closed sagital rightTMJ before treatment. The differential diagnosis of effusions in the TMJ has a broad-spectrum as of joint effusions in other skeletal regions. A MRI (magnetic resonance imaging) can give a lot of information and not only the disk position. In this case THE PATIENT HAS NO DISK. 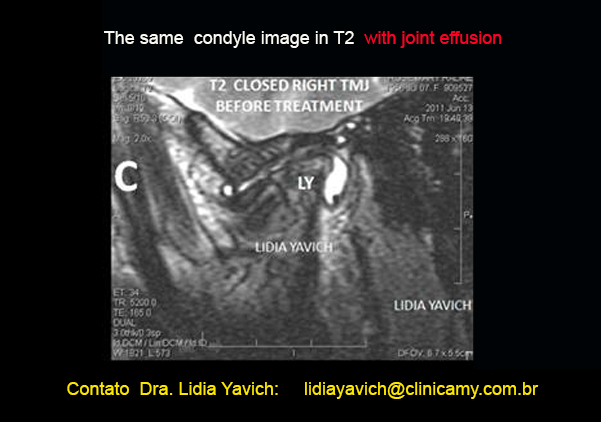 The same sagittal slice of the condyle in T1 and T2. 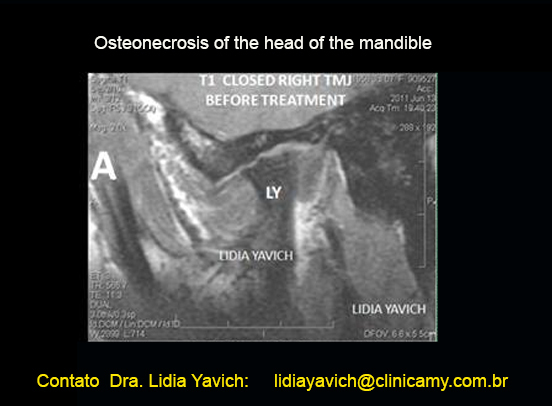 Image A shows osteonecrosis of the head of the mandible and image C shows the articular effusion. The patient complained from severe pain in the TMJ, headache, and pain on the back of the neck. The patient had a major trauma history in the jaw in adolescence. She had rheumatic fever in childhood. We referred her to a rheumatologist, and in that moment she did not present positive results for inflammatory systemic disease. Her muscles were electronically deprogrammed and a DIO (Intraoral Device) was constructed in a neurophysiological position. In other publications we mentioned the computarized kinesiographic used methods. 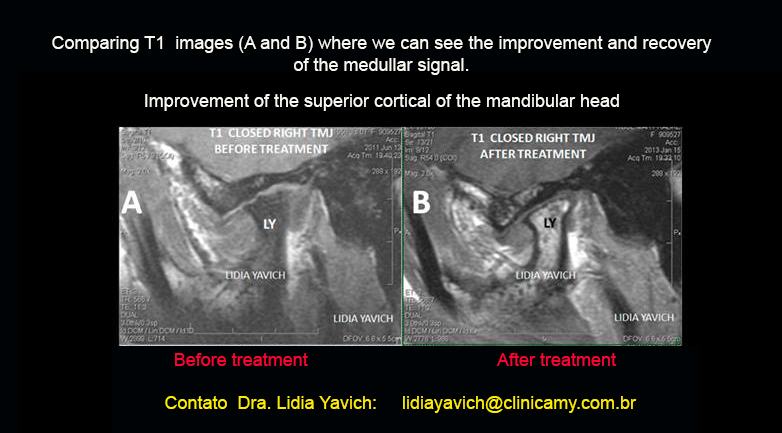 Comparing T1 images: A (before the treatment) and B (after the treatment): we can see the improvement and recovery of the the medullar signal. 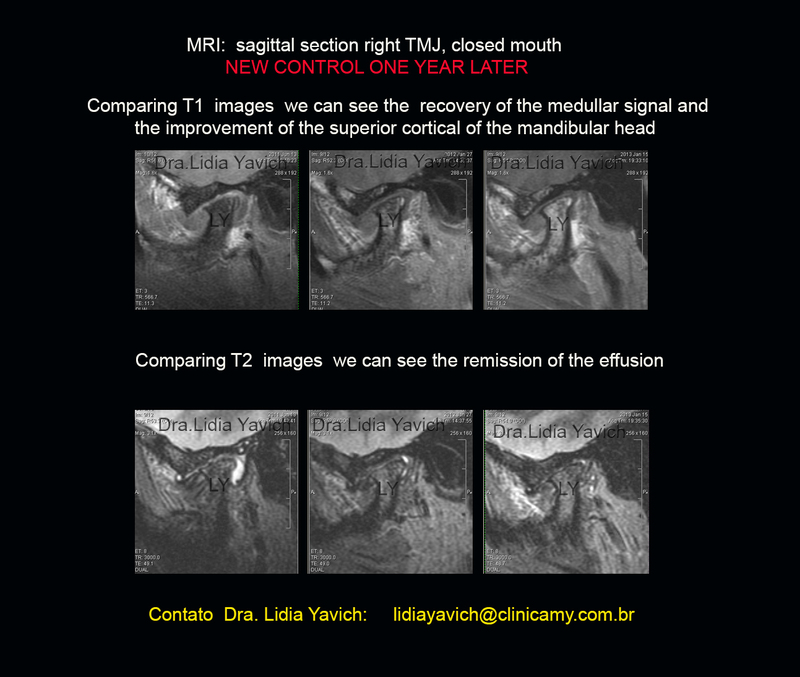 Improvement of the superior cortical of the mandibular head. The differential diagnosis and the systemic condition of the patient must be taken in account for the prognosis of the case. 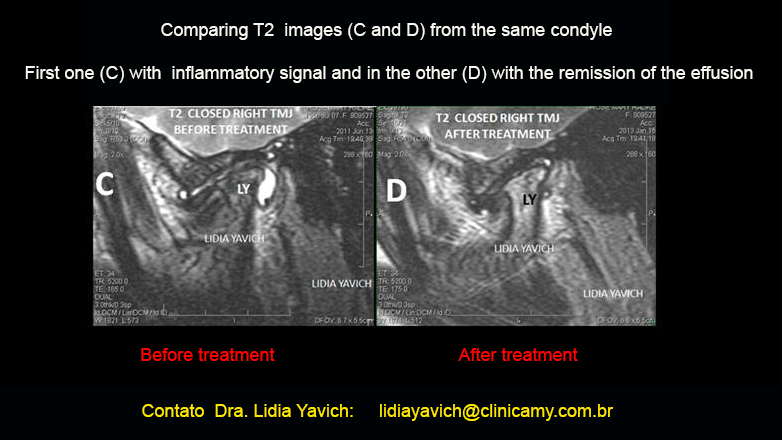 Comparing T2 images: C (before the treatment) and D (after the treatment).It is clear in the first one (C) the inflammatory signal and in the other (D) the remission of the effusion. 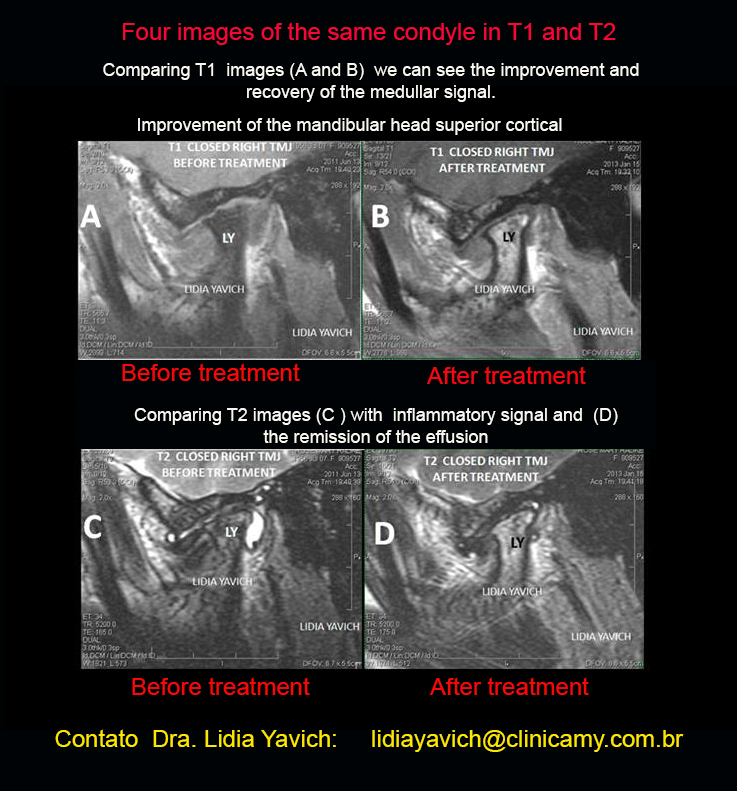 Comparing T1 images (A and B) we can see the improvement and recovery of the medullar signal and the superior cortical of the mandibular head. In T2 weightened images (C and D) it is clear (in C) the inflammatory signal and in the other (in D) the remission of the effusion. One year after the second image, a new control was solicited, and the results were even better. In this case I decided NOT TO GO forward to a second phase. Diagnosis is essential for each case. Dentistry need to understand like Medicine do, that we have limitations and if a patient needs to live with an orthotic it is not the end of the world. We have patients that are going to live with insulin all their life, or with other medicines that are saving their lives or just improving their life quality. 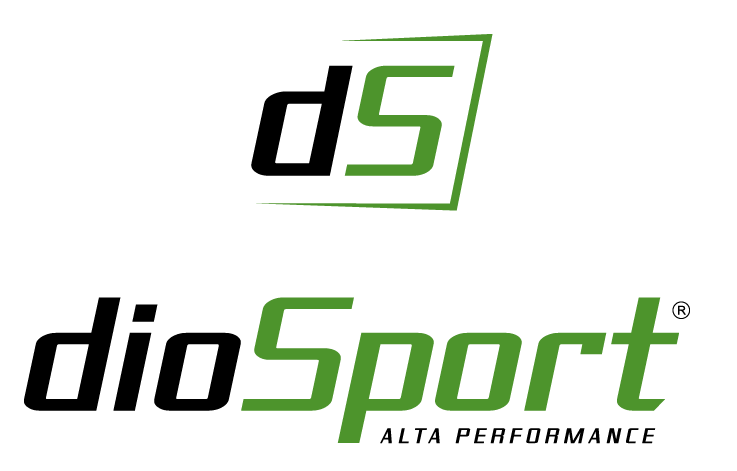 Therefore, diagnosis is essential and for that all the tools that can help to get there are welcome.